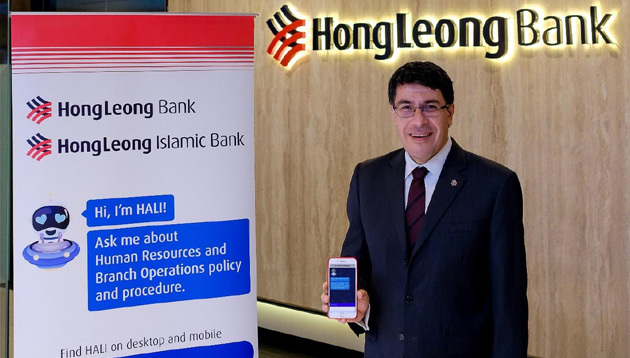 Hong Leong Bank (HLB) yesterday introduced a virtual assistant named HALI which will help the bank improve operations efficiency by 60% over the course of the year. A first in Malaysia, HALI is set to assist two main core support functions – HR and branch operations. Developed for HLB by Hyperlab, the chatbot will take over in answering staff queries on policies and procedures, vastly improving efficiency. HALI is able to learn and automate the queries asked every month by bank staff and by moving repetitive and manual operations (such as answering emails and internal telephone enquiries) to HALI, the bank estimates a 60% improvement in internal operations efficiency. As a result, more time can be spent on building relevant training programs based on the data HALI collects. For bank staff, having HALI means being able to make enquiries with regards to HR policies and procedures (including medical benefits, staff loans, leave policy, and payroll) from their personal digital devices 24/7. Domenic Fuda, group managing director and chief executive officer of HLB, emphasised that the bank is constantly looking at ways to leverage on technology to increase efficiency and productivity, reduce turnaround time and improve overall compliance to policies and processes. The launch of HALI comes on the heels of the introduction of an e-learning mobile application called ‘SmartUp’ which enables HLB’s employees to access bite-sized learning content via their mobile devices.